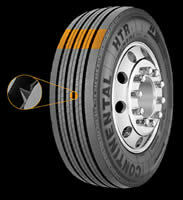 Wide tread and new tread compound provide long original tread life. Pyramid stone ejectors in all tread grooves help to eliminate stone retention for long casing life. Tread pattern designed for optimized footprint and reduced noise.